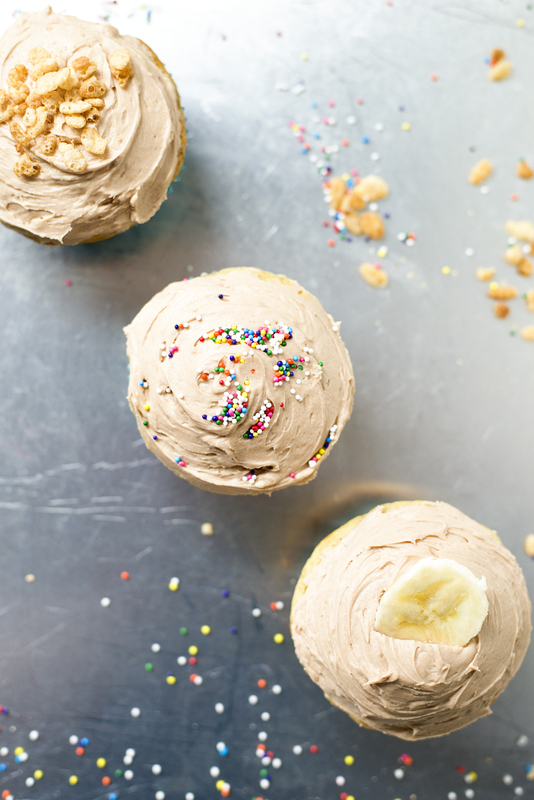 Banana Cupcakes with Nutella Buttercream Frosting + 5 Unique Cupcake Links! After playing a round of “would you rather” with the kids the other day, I discovered I would rather eat a cupcake than eat pretty much anything else. I’m not sure if I love them because they remind me of the goodies that came out of my Easy Bake Oven or because of the perfect frosting to cake ratio. Either way I am hooked. Many believe the cupcake craze is over, we have moved on to cronuts and macarons. Maybe with the demise of Crumbs the hysteria for these sweet treats ended as well. So be it. Trends come and go, but for me a small delicious cake topped with a large dollop of sweet frosting that fits perfectly in my hand, no fork or knife needed, is always in. 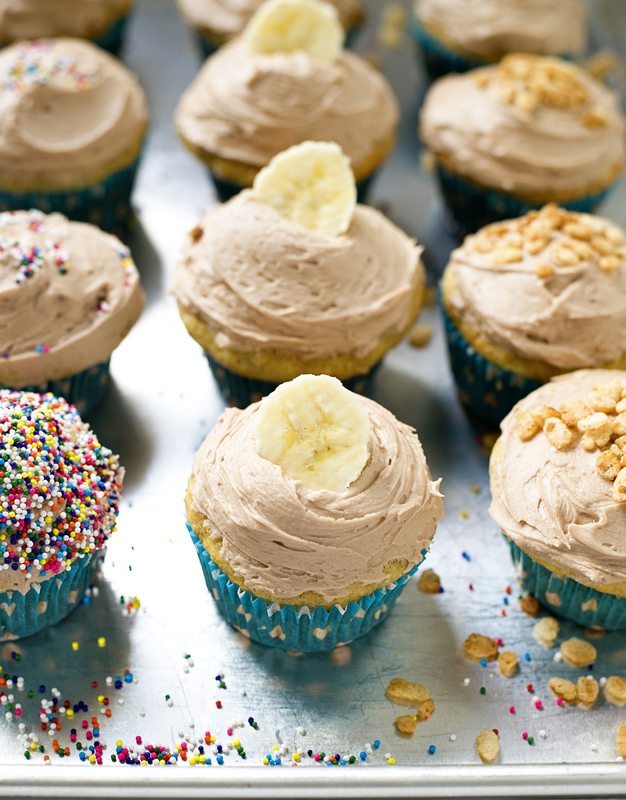 A moist and sweet banana cupcake topped with rich hazelnut chocolate buttercream frosting. 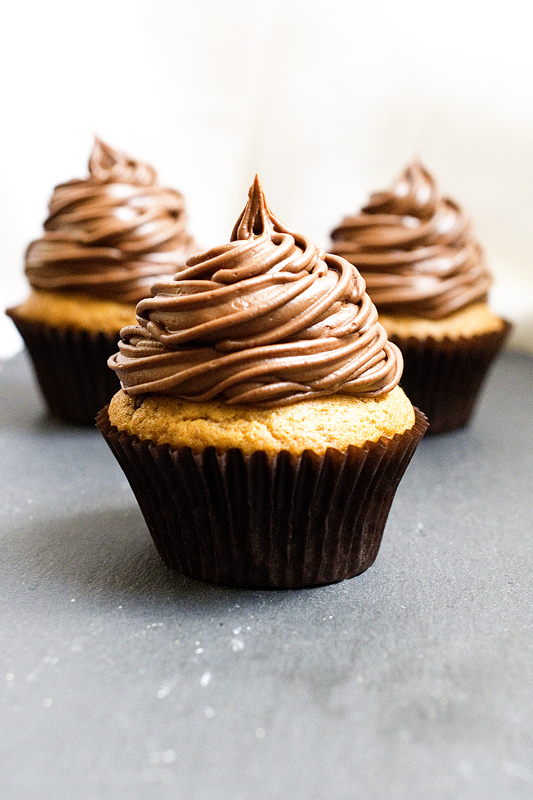 Nutella lovers will go crazy for this cupcake! Pre-heat your oven to 350F. Line a standard 12 cup muffin pan with cupcake liners. Whisk together flour, sugar, baking powder, baking soda and salt in a medium bowl. Make a well in the center of the dry ingredients . Pour the butter, mashed bananas, eggs and vanilla into the well and mix. Begin to stir in the dry ingredients and until just combined. Do not overmix! The batter will be thick. Evenly, spoon or scoop the batter into the muffin cups. Bake for 20-25 minutes. Check your cupcakes at 20 minutes. If a toothpick inserted in the center comes out clean the cupcakes are ready. Remove cupcakes from pan and cool completely on a wire rack before frosting. Cupcakes taste best the day they are made. You can make them the night before, but store in an air-tight container until ready to serve. Enjoy! Using a stand mixer with a paddle attachment (or an electric hand-held mixer), cream together the butter and 1/2 cup of confectioners’ sugar. Add 1 tablespoon of Nutella. Add the another 1/2 cup of confectioners’ sugar followed by a tablespoon of Nutella. Add rest of confectioners’ sugar, followed by last tablespoon of Nutella. Turn off the mixer and scrape down the sides and bottom of the bowl. Add the vanilla beat on high for about 30 seconds. Next add milk, 1 tablespoon at a time until it reaches desired consistency. Add a pinch of salt and whip on high-speed for another 30 seconds. Frost your cupcakes adding as much or as little buttercream as you like. Garnish with sprinkles, toasted rice cereal or fresh banana slices. Banana slices will brown, so add just before serving. 5 Unique Cupcake Links You Should Check Out! My favorite chocolate confection is a turtle. The combination of caramel, chocolate and nuts makes me so very happy. Annie’s Eats turtle cupcakes are now on my must make list. I’m drooling. If you love strawberry cupcakes, check out Hint of Vanilla’s strawberry lime cupcakes. 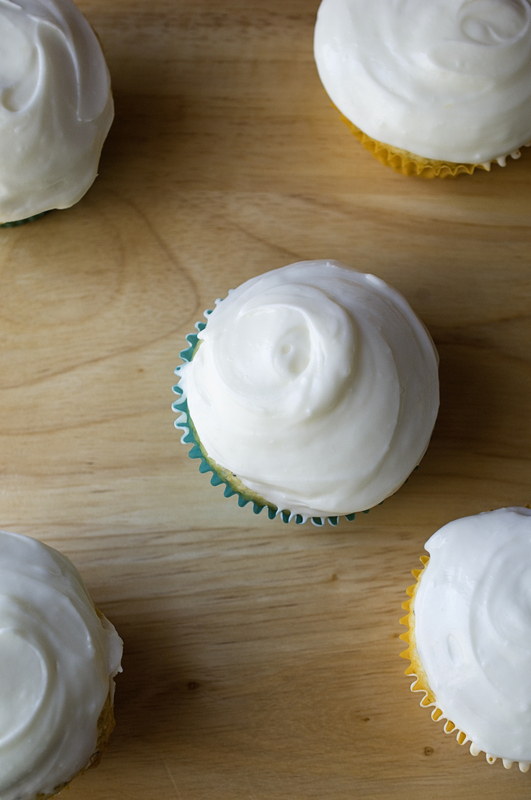 Need a perfect summer cupcake recipe for your next cookout? 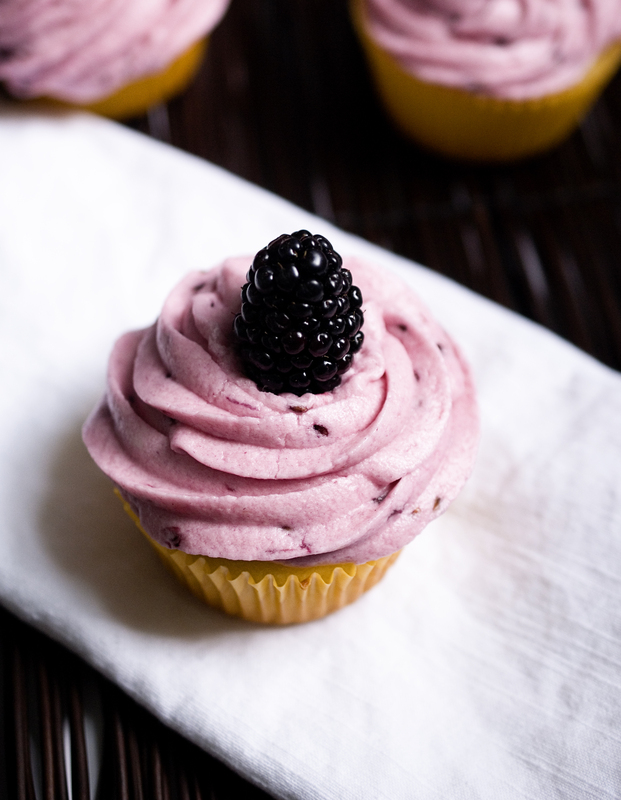 Check out my recipe for blackberry shortcake cupcakes. Gluten-free Shirley Temple cupcakes: yes, it exists and they sound delicious. Head to Simply Gluten-Free for the recipe. Father’s Day is coming up in a few weeks so how about treating dad to Bakers Royale beer and pretzel cupcake? Non-alcoholic version available too! Blackberry Shortcake Cupcakes + 5 Summer Cupcake Recipes You Can’t Miss! “School is over in one month Mama!” C excitedly announces the other day. “No, you have longer than that until summer break.” I assure her. “No! We! Don’t! Summer is coming!” I hurry over to our calendar, flip to June and realize she is right. School is almost out. Summer is almost here. Oh f%4#2! I’m not ready! I love summer, but after a few weeks of fun in the sun I am ready for a routine. I know: routine and summer just don’t sound right together. Your right. I need to embrace the freedom that comes with summer. No, I need camps. Camp makes everyone happy, including me. A few weeks of camp for C and G mixed in with family beach time and leisurely mornings sounds like a good summer. Right?! Hopefully, baby N will become that go with the flow, mellow third child everyone with 3 kids told me he would be; so far they are wrong. I think he still has a chance to turn it around! Yes, a cupcake does make everything better. This cupcake has a tender, and moist crumb. I mixed fresh blackberries into a basic frosting turning it a beautiful shade of purple. The blackberry flavor is subtle and the single berry on top is a treat, much like summer. Even as I lament about keeping C and G happy this summer, I must remind myself that summer is a short-lived treat. Like everything when you have little people ruling your life, it won’t last. Love it for what it is, now. Line a 12-cup muffin tin with cupcake liners and set aside. In a medium bowl, whisk together flour, cornstarch, baking powder and kosher salt. Set aside. Using a stand mixer with a paddle attachment, beat the sugar with the eggs and vanilla extract at medium-high speed until smooth and thick , about 3 minutes. Add the butter and oil and beat until combined. Be sure to scrape the bottom and side of the bowl. Add the dry ingredients and milk in 3 batches, mixing well between additions. Pour the batter into the prepared muffin pan about 2/3 the way full. Bake the cupcakes for about 20 to 23 minutes. Check your cupcake at 18 minutes. The cupcakes are done when they are springy and a toothpick inserted in the center comes out clean. Let the cupcakes cool for 5 minutes in the pan and then transfer them to a wire rack to cool completely. Using a stand mixer fitted with a paddle attachment, beat the butter for a few minutes or until smooth. On low-speed, add the confectioners’ sugar and a pinch of salt. Add the milk and chopped blackberries and beat at medium speed until thick and smooth. 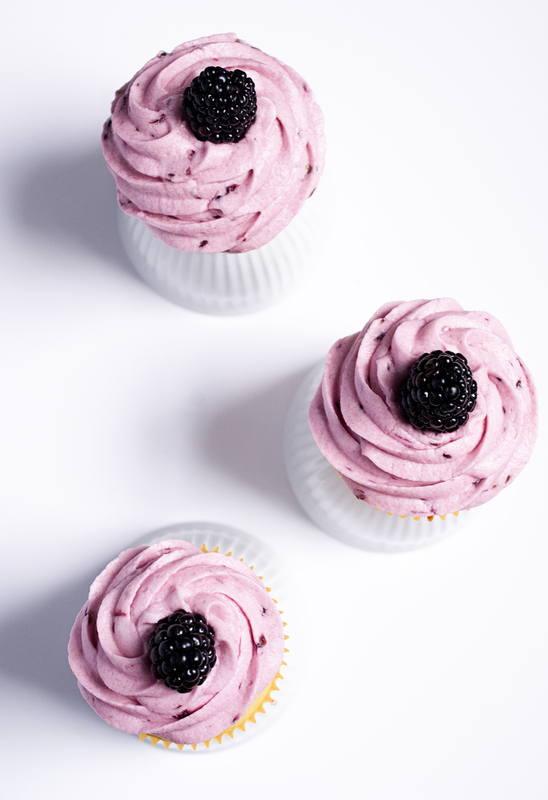 Pipe or spread frosting on each cupcake and add a blackberry for garnish. Enjoy! 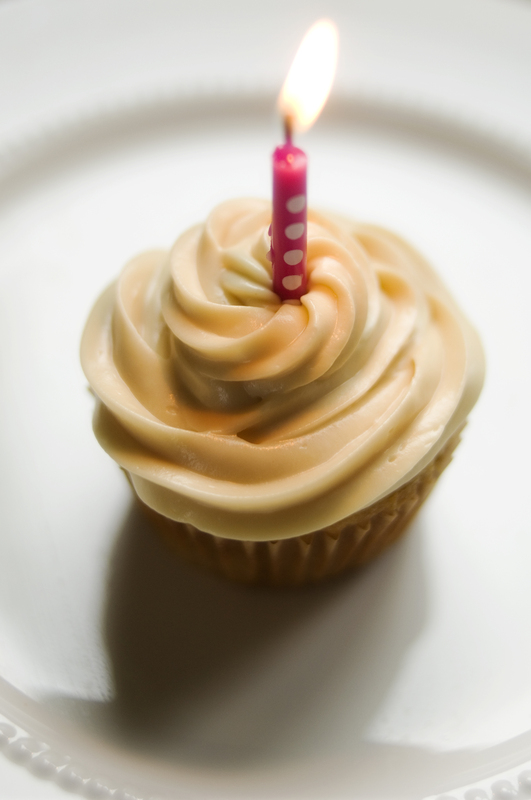 5 Summer Cupcake Links You Must Check Out! When I think of summer food I think lobster salad, fried clams and s’mores. Sally’s Baking addiction has a recipe for s’mores cupcakes: chocolate cupcakes stuffed with marshmallow filling, topped with milk chocolate frosting, crushed graham crackers and a toasted marshmallow. Amazing! I can’t wait to try it. Last week, I made a roasted strawberry frappe that tasted so, so good. Not up for a frappe aka milkshake ? How about a strawberry milkshake cupcake? Hummingbird High has the recipe for you. Yum! 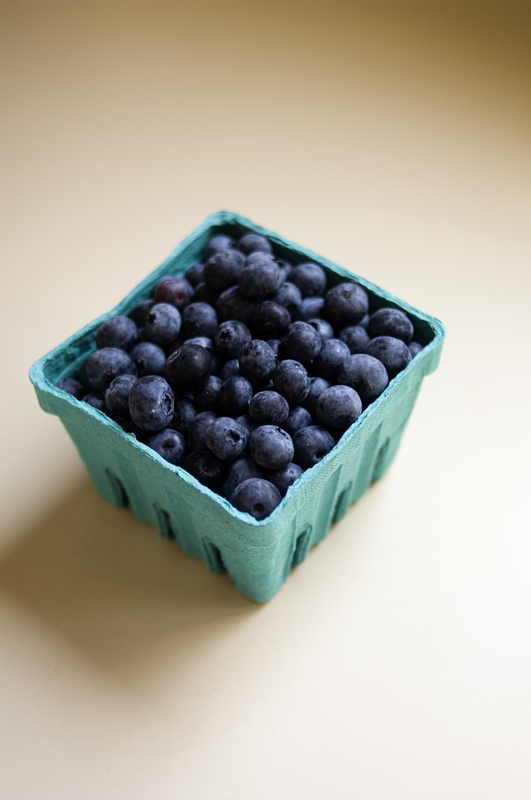 If you love blueberries, you should make the ultimate blueberry cupcake by Oh Sweet Day! I wish I could eat this cupcake now! I have a friend who loves key lime pie, but I am pretty sure he hasn’t tried key lime pie cupcakes. Tracey’s Culinary Adventures has the recipe. Next time I head to Duxbury I might just bring a batch. Raspberry Cheesecake Cupcakes– sounds like a perfect summertime dessert! Adventures in Cooking has the recipe and Eva’s photos are beautiful! 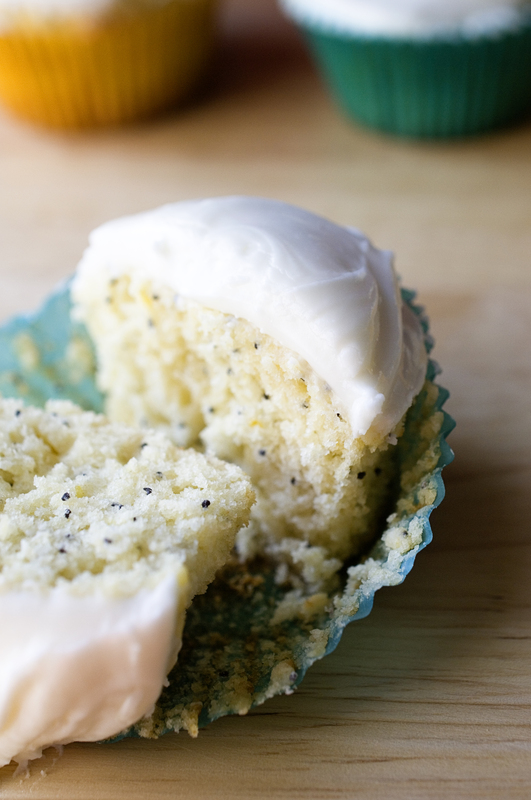 Lemon Poppy Seed Cupcakes with Lemon Cream Cheese Frosting + 5 Spring Cupcake Links! I called an old friend today to wish her a happy birthday. A few hours later she called me back. We attempted to have a conversation, but N started crying. Neither of us could ignore his helpless newborn cry so we said goodbye. I felt sad we couldn’t chat longer. I miss her. Distance and small children who need us make staying in touch difficult. We try anyway because we need each other. We try because we remind each other of who we are. We try because a 20 year friendship deserves it. One day our little people won’t need us as much and our conversations will last longer than 5 minutes. So today we make an effort for one day. If today, we had more than 5 minutes to chat this is what I would have said: Happy birthday sweet friend! It is so good to hear your voice. I know, it is hard to believe we haven’t talked since N was born. Crazy how 5 weeks fly by. Lets not let another 5 weeks go by. Are you taking some time for yourself today? You should. No, don’t feel guilty. You deserve some time just for you. They will be ok. I wish we could grab a drink tonight and chat and eat the cupcakes I made. I think it is so cool your birthday falls on the first day of spring! Spring means a new beginning. This 36th year is your new beginning. Surprise yourself this year. Do something adventurous, and call me and tell me all about it. Also, be patient with yourself. You have a lot going on and there is only so much you can do in a day. Go for a run to clear your head as often as you can. Go to yoga and breathe out whatever is troubling you. Stop debating about whether you should have a second piece of cake today. You should damn it! It’s your birthday! You mentioned buying eye cream. You should buy some. Time is not our friend. If it works let me know! I know you have to go, me too. I hope this is your best year yet. I love you and miss you terribly. Bye for now. Pre-heat your oven to 350. Line a 12 cup standard size muffin pan with cupcake liners and set aside. Separate 2 eggs and set aside. Sift and measure 1 and 1/2 cups of cake flour into a medium bowl. Stir in 2 teaspoons of baking powder and a 1/4 teaspoon of kosher salt. Set aside. Using a stand mixer, fitted with a paddle attachment, beat 1 stick of butter until light and fluffy. Add 1 cup of sugar and lemon zest. Cream until light and fluffy, scraping down the sides once or twice. Add the egg yolks, one at a time. Now add vanilla extract and fresh lemon juice. Once it is well combined, add the flour mixture and milk alternately. Start with 1/3 of the flour and then 1/3 of the milk, ending with the flour. Stir until just incorporated. Do not over mix! In a separate bowl, whisk the egg whites until soft peaks form. Gently fold the egg whites into the batter. Spoon the batter, about 2/3rd the way full, into the prepared muffin pan and bake for about 18-20 minutes. Let the cupcakes cool in the pan for 5 minutes before transferring them to a wire rack to cool completely. The cupcakes will last in an air tight container, at room temperature for 2 days. Enjoy and happy spring! Using a stand mixer with a paddle attachment, beat the cream cheese, lemon juice and confectioner’s sugar until smooth. Add a pinch of salt. Continue to add sugar until you reach desired consistency. Refrigerate the frosting for about an hour so it firms up a bit. 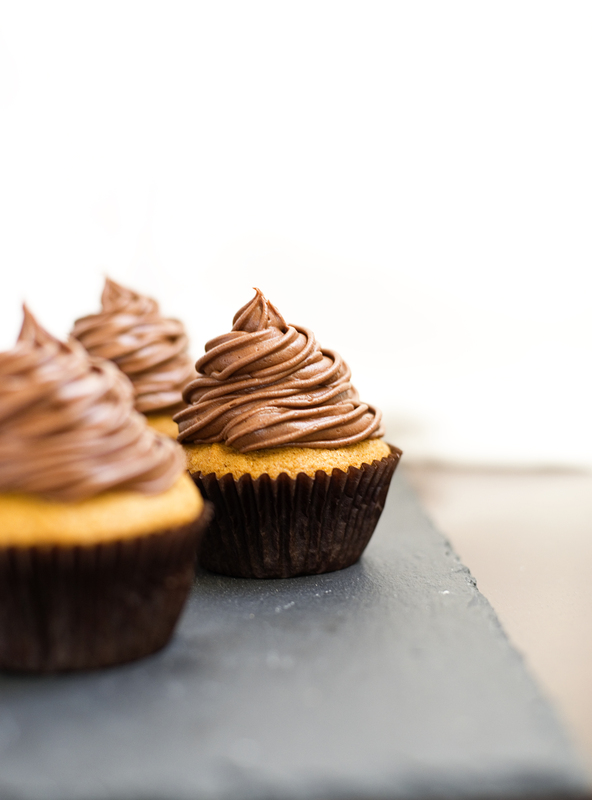 Once firm, frost your cupcakes with as much or as little frosting as you like. Enjoy! 5 Spring Cupcakes You Should Try! If you like lemon meringue pie, why not try the cupcake version? Cooking Classy has a recipe that looks fantastic and I’m guessing tastes even better! 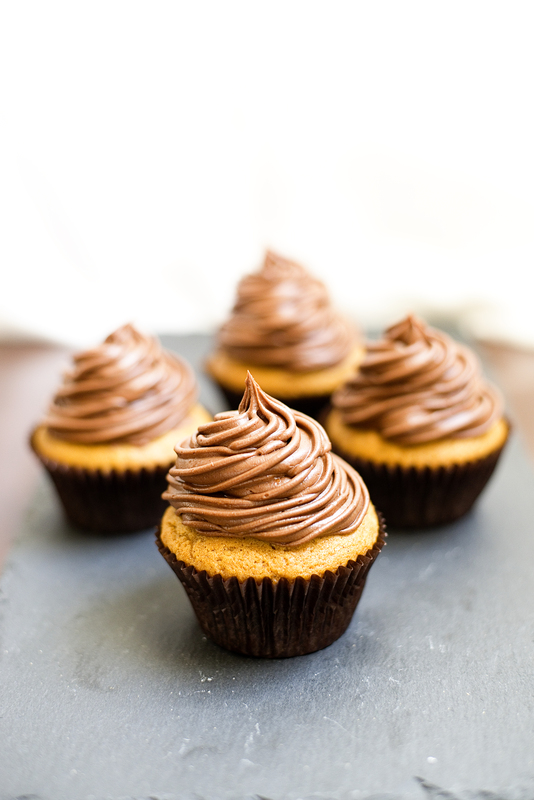 Looking for a cupcake recipe to try on your more adventurous eaters? I found it! Head to Annie’s Eats for her strawberry balsamic cupcake recipe. I love the combination of raspberries and lemon. I need to make this cupcake by My Baking Addiction very soon. I love carrot cake, especially in cupcake form. 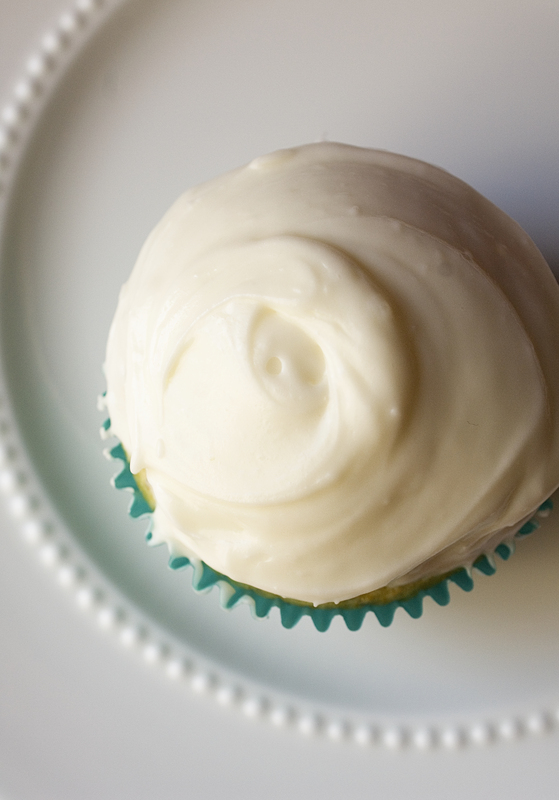 The Cupcake Project has a carrot cake cupcake recipe that promises to be moist and delicious. Check it out! Peeps and Easter go hand in hand. I love Peeps, especially when they are a little stale. How about a vanilla cupcake, frosted with vanilla raspberry marshmallow frosting, topped with a pink peep? Yes please! Heather Cristo has the recipe for you. I turned 35 a few days ago. 35. I was 25 yesterday, I blinked and now I am 35. It is not so much the number that bothers me but more the passage of time. It goes by too fast. I would rather be where I am now at 35 than where I was at 25. I like myself more now than I did 10 years ago. That is saying a lot because I am a pretty harsh critique of myself. So to celebrate the start of my 35th year we hired a sitter and Bubba and I went to an excellent restaurant in the North End called, Carmen. I had linguine with clams in fra diavolo sauce. The sauce was fresh and spicy and creamy all at the same time. The pasta was cooked to perfection and the clams were off the boat fresh. Bubba ordered scallops on a summer risotto with bacon. Amazing! After dinner, we took a long stroll and ended up at Lulu’s Sweet Shop. Lulu’s is known for their cupcakes. I love cupcakes. After eating a carrot + pineapple cupcake with cream cheese frosting in less than 3 minutes, I started thinking about cupcakes, a lot. 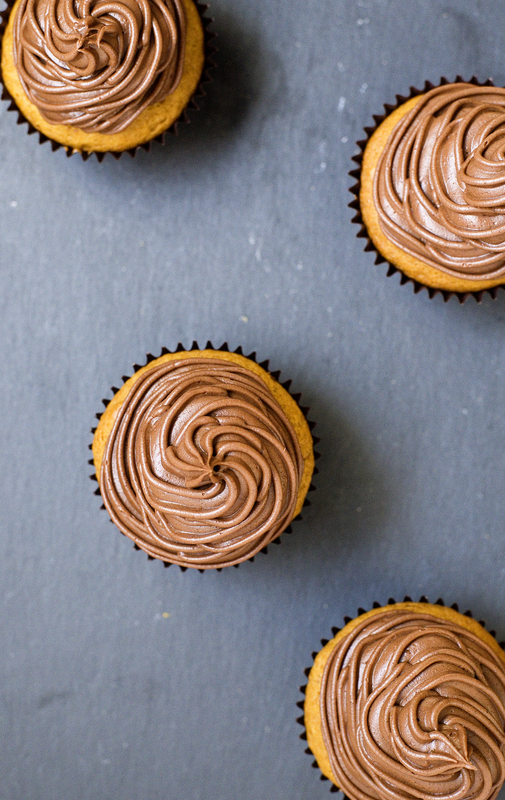 The next morning I obsessively looked at dozens of cupcake recipes until I came across one by Smitten Kitchen called Peach Cupcakes with Brown Sugar Frosting. I’m sold! I love peaches but peaches in a cupcake was something completely new and exciting. These cupcakes are very easy to make. The cake itself is very moist and light. The peach pieces add a fresh sweetness. The frosting is not like any frosting I’ve had and I think this it would work well on a number of cakes or cupcakes. I might try it on a carrot cake or spice cake next time. I didn’t tweak either of the recipes at all. Maybe next time I’ll switch things up a bit, but I think they are pretty perfect just the way they are. Give them a shot! You will not be disappointed. Take them to a friend on her birthday. Who doesn’t love a cupcake? Preheat the oven to 350 and line 24 muffin cups with paper liners. In a medium bowl, sift together the flour, baking powder, baking soda, salt and nutmeg and set aside. Cream the butter and sugars together until light and fluffy. Add the eggs, one at a time, scraping down the sides and bottom of the bowl between each addition. Add the vanilla. Gently mix the yogurt, buttermilk or sour cream. Add the dry ingredients to the wet ingredients. Do not over mix. Fold in the peach chunks. Divide the batter evenly among the prepared cupcake liners. I use an ice cream scoop for this part. 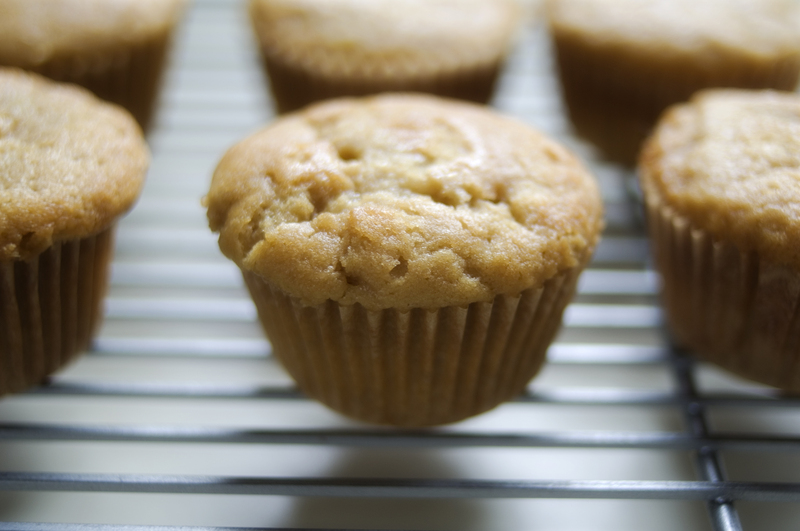 Bake for 18 to 22 minutes, or until a tester inserted into the center of cupcakes comes out clean. Check at 18 minutes and continue baking if necessary. Cool the cupcakes for about five minutes in the muffin tin. After 5 minutes, place on a wire rack to cool completely. Whisk together the brown sugar, cornstarch and powdered sugar. Using a stand mixer, beat the cream cheese and butter until fluffy. Add the sugar-cornstarch mixture and vanilla. Beat until frosting is smooth and light. Refrigerate the frosting until it thickens back up, about 30 minutes and spread on cooled cupcakes. I bought an inexpensive Wilton’s decorating kit at Michael’s. This is a good purchase if even if you only like to occasionally decorate cakes and cupcakes.